It’s important to realise that correcting your IELTS essay can be divided into THREE PARTS. This tutorial focuses first on LANGUAGE COMPONENT then the ACADEMIC WRITING, then CORRECTING IN THE EXAM. Spend time writing your first essay – we are working on LANGUAGE SKILLS. Check the grammar rule, deconstruct the sentence, check if it follows the rules. Research the GRAMMAR RULE – do online quizzes, do translations, MASTER that specific rule / construction. You take whole fragments of text and put it into google using the EXACT MATCH SEARCH in google, find out how many times it was mentioned. Get feedback from an online service / tutor / friend – in my experience if you are asking a friend just say CIRCLE the errors – don’t expect them to explain the grammar rule! Might be more confusing! Personally, I think MASTERING CONSTRUCTIONS / SENTENCE STRUCTURE is easier, faster, and more effective. For example, if the tests were never allowed to happen, there would most likely be serious consequences such as…. For example, if the government was never allowed to implement such changes, there would most likely be serious consequences such as…. Now we focus on IMPROVING the essay. Look for opportunities to IMPROVE the vocabulary. Opportunity for UPGRADING the sentence? A different structure? A more advanced structure? DO IT NOW, while you have the luxury to experiment! Do not do this in the EXAM. Play it safe in the exam. Go for clarity! Correcting your work – especially SELF CORRECTION is a valuable skill to have. It can boost your score. Develop this skill, then spend 5 minutes correcting your own essay in the exam, this will help you pick up easy points. If you want your essay corrected by a professional service, have a look at this page. You can watch this tutorial here on Youtube. Very good suggestion sir thank you . I am preparing to retake the Ielts test and I am looking for some guidance. I would like to get more information and for example for the writing practices how fast is the feedback , I just have a month to be prepared. Thank you, I am looking forward any response. Thanks for your comment, Esteban! 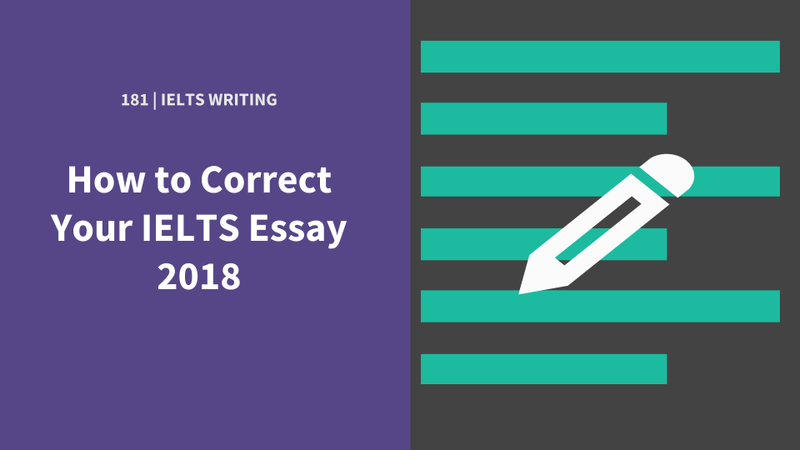 Check out https://www.ieltspodcast.com/essay-correction-service/ for high-quality IELTS essay correction within 24 hrs.